Add instant elegance to your home with a brand-new hardwood or ceramic floor installed by the experts at Reyes Custom Floors. We don't cut corners-all floors are installed according to manufacturer guidelines and include a one-year warranty. We even leave proper gaps for expansion. 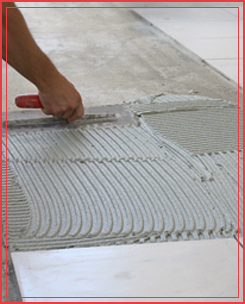 Our friendly experts will guide you through the entire installation process. We can even design custom inlays and make medallions and borders to complement your home. We repair hollow spots, loose planks, delaminations, peaking, broken tiles, and even grout that's changed color. If we cannot find a necessary replacement, we will custom design a piece to restore your floor. Some flooring issues may be covered by the manufacturer- please contact us in Fort Worth, Texas, for further details. Reyes Custom Floors uses state-of-the-art equipment to remove and grind old tile, ultimately preparing your floor for a new installation. We are one of four contractors in the area offering dustless tile removal and the only one you can count on to get the job done right. While other contractors mark materials up as much as 35%, we sell all materials at cost. This includes both tile and wood! We are able to do this by avoiding the middleman and putting you in direct contact with the manufacturer.